The world's newest nuclear fusion reactor was switched on in the UK last week and has already managed to achieve 'first plasma' - a scorching blob of electrically-charged gas. Scientists hope the tokamak reactor will be able to make hotter and hotter plasma - eventually reaching 100 million degrees Celsius (180 million degrees Fahrenheit) by 2018. That's the 'fusion' threshold - seven times hotter than the centre of the Sun - at which hydrogen atoms can begin to fuse into helium, unleashing limitless, clean energy in the process. It is the latest in a number of significant developments towards finally realising practical nuclear fusion. Long talked about as the clean and almost limitless power source of the future, it has stubbornly remained "of the future" for decades. Our current nuclear power stations use nuclear fission – essentially splitting an atom’s nucleus. 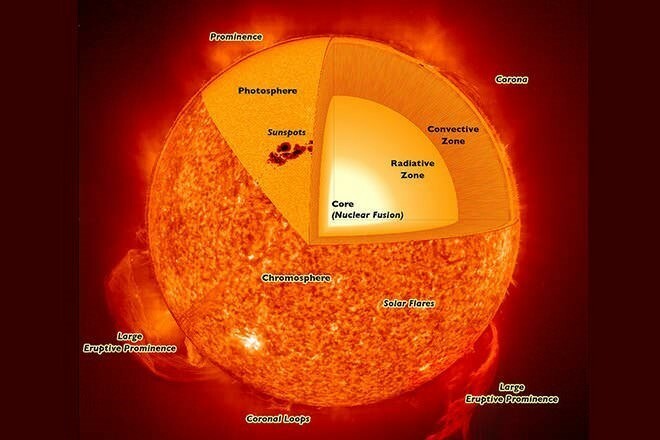 Nuclear fusion is what happens in the Sun and other stars and involves joining two atomic nuclei to make one larger one. Both reactions release large amounts of energy, but with nuclear fusion there is very high energy yield and very low nuclear waste production. Fusion occurs when two light atoms bond together, or fuse, to make a heavier one. The total mass of the new atom is less than that of the two that formed it; the "missing" mass is given off as energy, as described by Albert Einstein's famous E=mc2 equation. There are several "recipes" for cooking up fusion, which rely on different atomic combinations. The most promising combination for power on Earth today is the fusion of a deuterium atom with a tritium one. The process, which requires temperatures of approximately 72 million degrees Fahrenheit (39 million degrees Celsius), produces 17.6 million electron volts of energy. Deuterium is a promising ingredient because it is an isotope of hydrogen. In turn, hydrogen is a key part of water. A gallon of seawater (3.8 litres) could produce as much energy as 300 gallons (1,136 litres) of petrol. What is the future of nuclear fusion? What is a dirty bomb, and how dangerous is it? While fusion power offers the prospect of an almost inexhaustible source of energy for future generations, it has also presented many so-far-insurmountable scientific and engineering challenges. In the Sun, massive gravitational forces create the right conditions for fusion in the star’s core, but on Earth they are much harder to achieve. 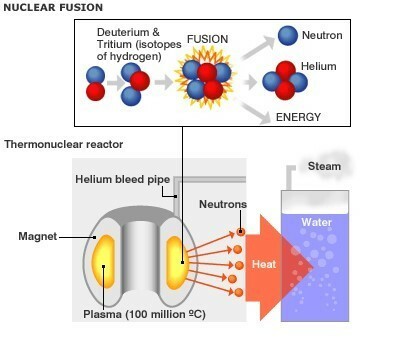 Fusion fuel – different isotopes of hydrogen – must be heated to extreme temperatures of the order of 50 million degrees Celsius, and must be kept stable under intense pressure, and dense enough and confined for long enough to allow the nuclei to fuse. And this is where progress has now been made. Advances in magnet technology have enabled researchers at MIT to propose a new design for a practical compact fusion reactor that might be realized in as little as a decade, they say. New superconducting magnets would enable the reactor to operate in a sustained way, producing a steady power output, unlike today’s experimental reactors that can only operate for a few seconds at a time without overheating. The era of practical fusion power, and an inexhaustible supply of energy, may finally be coming near.